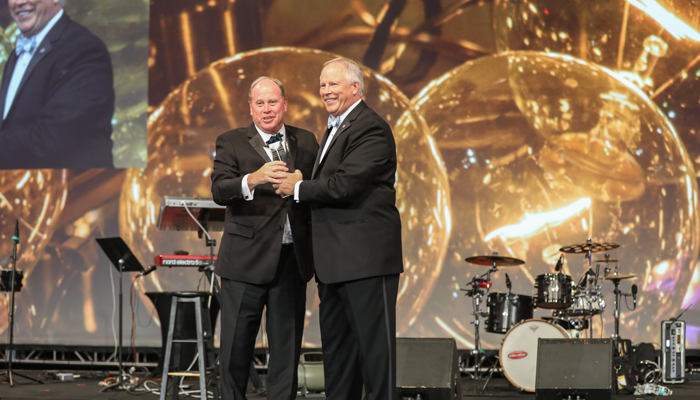 Miami, FL (March 2, 2017) – Howard W. “Hoddy” Hanna, III, chairman of Howard Hanna Real Estate Services, was the winner of the prestigious Leadership Award from Leading Real Estate Companies of the World®, which celebrates a member broker whose leadership skills and achievements have drawn the attention and admiration of others. The award was presented during the Leading Real Estate Companies of the World® Conference week, a series of events that drew an impressive audience of 2,000 real estate professionals from 25 countries. Hanna was recognized for his focus on innovation and growth, which has enabled his company to prosper during all types of real estate markets, helping make it the third largest real estate company in the United States, with more than 9,000 agents and employees in 271 offices across eight states. He has been active on a regional Federal Reserve board and was an early proponent of providing mortgage, title and many other services to provide one-stop shopping for clients. He was also recognized for his tireless work as a philanthropist including chairing Family House, a home-away-from-home for patients and families with life-threatening illnesses; raising millions of dollars in financial aid for deserving students at a Central Catholic High School; serving on the Children’s Hospital of Pittsburgh Foundation board since its inception, and managing an annual campaign for his company that has raised more than $12 million for children’s health care. He has received top leadership awards from Ernst & Young, the Jewish National Fund, the Anti-Defamation League, RISMedia, Bank of America, and Inman News. Howard Hanna Real Estate Services partners with LeadingRE (www.LeadingRE.com) in PA, OH, NY, VA, MI, WV, NC & MD. With a global membership that spans six continents, LeadingRE connects more than 550 firms and 130,000 sales associates who produce over 1.2 million real estate transactions each year. As a member of LeadingRE, Howard Hanna provides a quality real estate experience, global marketing reach and access to top real estate professionals in virtually any market worldwide. About Howard Hanna: Howard Hanna Real Estate Services is the third largest real estate company in America, the #1 privately owned broker in the nation, and the largest home seller in Pennsylvania, Ohio, and New York. The family-owned and operated real estate company specializes in residential and commercial brokerage service, mortgages, closing and title insurance, land development, appraisal services, insurance services, corporate relocation and property management. With more than 270 offices across PA, OH, NY, VA, MI, WV, NC and MD, our more than 9,000 sales associates and employees are guided by a spirit of integrity in all aspects of the real estate process.